On Thursday, November 17, Rabbi Joshua Davidson did something truly extraordinary: he prayed the weekday morning service. The synagogue which he serves as Senior Rabbi, Temple Emanu-El in New York City, apparently offers no such opportunity, so what inspired his religious fervor? While this assertion may play well in his Temple and at the UJA, one does not gain allies by slandering them. To Israelis, Rabbi Davidson’s words are not merely false and defamatory, but contribute directly to the anti-Semitic depiction of Israel as a supremacist, apartheid state where only some citizens have rights. There is no factual support for his claim that the “Kotel” regulations do not permit egalitarian worship. Thanks to overwhelming popular demand, a small section of the Kotel, comprising only one-sixth of its total length, has been allocated for traditional Jewish prayer. During the high holiday season alone, that traditional plaza saw over 1,000,000 visitors, and on multiple occasions was filled to capacity. For nearly two decades, the Israeli government has provided facilities for egalitarian and other nontraditional prayer elsewhere along that same 1600-foot-long Western Wall. This section was upgraded and dubbed “Ezrat Yisrael” by then-Religious Affairs Minister Naphtali Bennet during the previous government; it features tables with large umbrellas, comfortable chairs, and Torah scrolls under the administration of the Masorti (American Conservative) movement. Though it may be smaller in absolute terms, this space has never been filled, and thus is less in need of expansion. Less than 0.3% of Israelis affiliate with the American Reform or Conservative movement, according to a survey conducted by the pluralistic Panim organization — and, of course, weekday prayer is mostly foreign to them. During the same High Holiday season, the Ezrat Yisrael section stood almost entirely empty. Rather than conduct their prayers at the space allocated for their use, Rabbi Davidson and his peers brought eight Torah scrolls from the outside and pushed their way into the traditional plaza — purportedly for a weekday morning service that requires only one scroll for a brief reading. They had no need to enter the traditional plaza in order to conduct their non-traditional, egalitarian service. The only time eight Torah scrolls are carried is while dancing on Simchat Torah. And that is exactly the point: they were not coming to pray, but to dance. They came to provoke and create a disturbance, using eight holy Torah scrolls as props for their political theater. They were not content to simply protest; they forced their way past the soldiers and police guarding the plaza. Although Rabbi Davidson’s family was safely back in New York, Israelis know that these soldiers — often members of their own families — are putting their lives on the line to protect visitors every time they search a bag. It is also against the law to bring in Torah scrolls, because someone might thus be able to steal one of the scrolls belonging to the Holy Site. 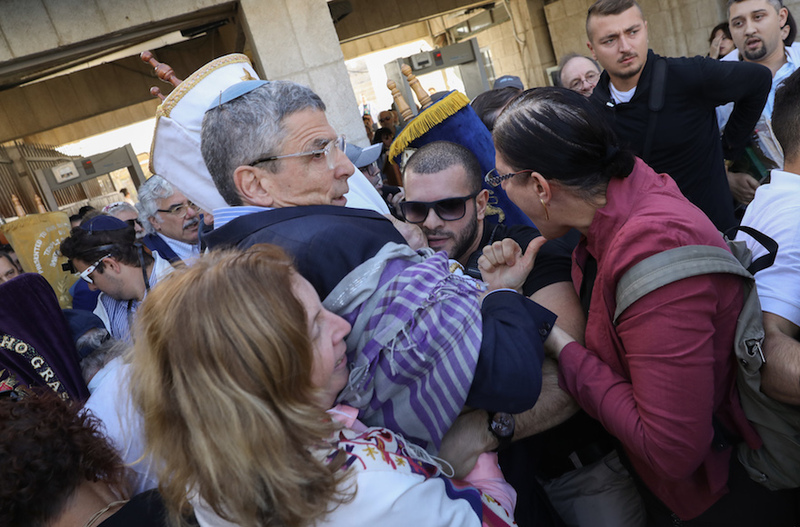 To whatever extent Rabbi Davidson was “roughed up” — and those guarding the security barrier tell a different story — this transpired while he was physically breaking past the guards, breaking the law while interfering with the soldiers’ attempts to protect life, safety, and the sanctity of the Torah scrolls Rabbi Davidson claims to revere. So, no. No one was “roughed up” due to being a Reform Jew, much as saying so delighted anti-Semitic bigots around the globe. Whatever violence transpired was directly attributable to the behavior of Rabbi Davidson and his colleagues. This is undeniable. The same Reform leaders also refused to take a phone call from President Donald Trump before the High Holy Days, not long after Union for Reform Judaism President Rabbi Rick Jacobs and several colleagues sat down for a friendly chat with Mahmoud Abbas, leader of the Palestinian Authority. After that meeting, Husam Zomlot, PA ambassador-at-large to the United States, told the Jerusalem Post that “we see eye-to-eye with the Reform movement.” Most recently, the movement explicitly turned against both Israel and America, stating that recognition of Jerusalem as Israel’s capital, and the move of the US embassy to that city, must be held hostage to a “peace process” that Abbas refuses to pursue. If Reform now sees “eye to eye” with a Palestinian Authority that refuses to acknowledge Israel as a Jewish state, and would withhold recognition of Jerusalem as Israel’s capital, it is clear who has abandoned whom. Is it any surprise that Israelis have lost patience? The authors are the President and Managing Director, respectively, of the Coalition for Jewish Values This article first appeared in the Times of Israel.